We counted 242 cars roll in to Pacific Raceways for the 2014 Port Townsend Cruise, a noticeable decline in attendance from years past. The weather certainly could have played a big part with extended forecasts predicting about a 90% chance of rain that day but even the “usual suspects”, for the most part, were nowhere to be seen. A few familiar faces rolled through and as always it was a pleasure to see our fellow Euro enthusiast friends. And despite the lower than usual attendance numbers Achtuning was still able to bring in just under $4900 from the sale of raffle tickets to benefit Seattle Cancer Care Alliance! When we felt we had enough pictures we quickly packed up and rushed out of town to satisfy a craving we’ve had since last November… we were en route to J’aime les Crepes Creperie in Kingston. It has become an annual mission to chow down on some amazing crepes before hopping on the ferry we take to get home – Mission complete! 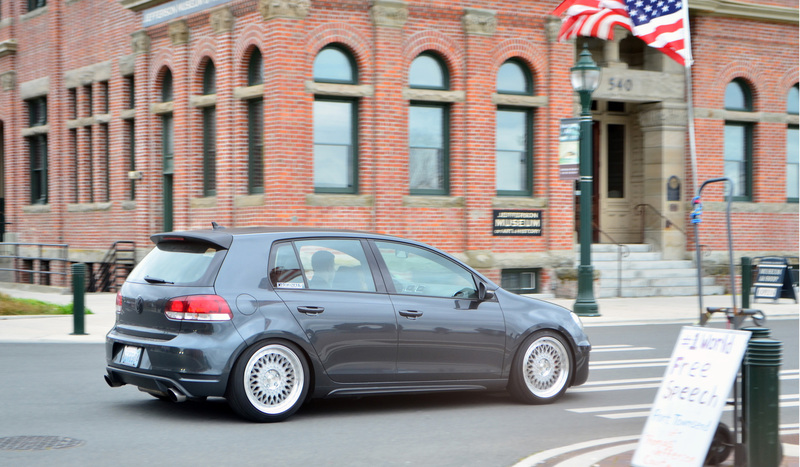 H&R ultra-low coilovers, 20″ matte anthracite Hartmann HRS6 wheels, and StopTech Trophy BBK. If he’ll ever wash the thing I’d love to do a shoot! Parts will be coming off of it at some point and will end up on his Mk6 GLI next.